Lagondaforum » How to use ? For using the Forum please register: put in a user name, we recommend simply your name or you may use your club member number or both, you choose a password, put in your e-mail, and try to read the security check and type it in. Then you read the Guidelines of the forum (correct use and behaviour on a forum in general). You check the Accept box and submit your registration. The administrator of this forum will then receive a notification of your application and he will check that you are a true Lagonda enthusiast to avoid spammers. After that your account will be activated and you will be able to log in to the forum with user name/password. The Lagonda Forum is divided into several categories, like "General", "Search & Find" or a category for each type of car. Each category has several forums. For example the category "2 Litre" has 2 forums: "Motor" and "Other". We may increase the number of forums later. In each forum you can start a new topic or you can reply to an existing one. For example if you go to the “2 Litre” category and the forum “Other” (other topics than motor) and you want to contribute to the discussion about the 2L clutch (“topic” started by don courtney), then you click on “Add Reply”. 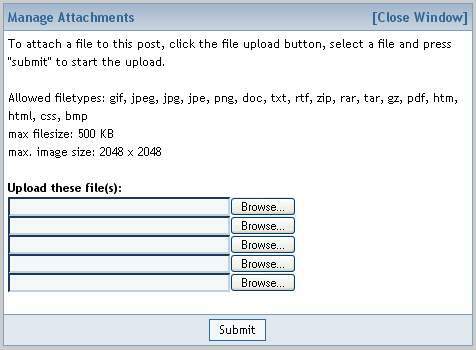 The window for entering your reply will open (the topic off course is the 2L clutch), here you enter your text and you can click on “manage attachments” if you want to attach an image or another file. The maximum allowed file size is 200 kByte, but please try to keep your images small (with reasonable compression 100kB is often good enough). To attach it you click on “browse” select the file on your computer and by selecting “submit” your file will be uploaded. Now you can close the manage attachment window. Don’t forget to submit your text contribution. If you want to start a new topic within “2 Liter”, “Other” e.g. about the 2 Litre gearbox, then you go to the 2L category, “Other” topic and click “New Topic”. Now you can give it a title (at least 8 letters) and write your text and attach files, same as in a reply. Don’t be afraid, if you find an error after you posted something, you can edit your post also in the future. Other usefull functionalities: “Search” allows to search for keywords within the whole Lagonda Forum or in parts of it. In “Members” you find all registered members. From here or from a post you can send a “Private Message” to a forum member. This is like an e-mail, so not open for others to see in the forum. User CP gives you some options to change your personal settings. click on the "letter in an envelope" symbol, this will create [email] [/email] and you have to write the e-mail address in between, e.g. "[email]peter.brown@brown.com[/email]". BBcode is an easy way for you to format your posts, just like you would in a word processor. Click the buttons above the content box to add BBcode to the post. 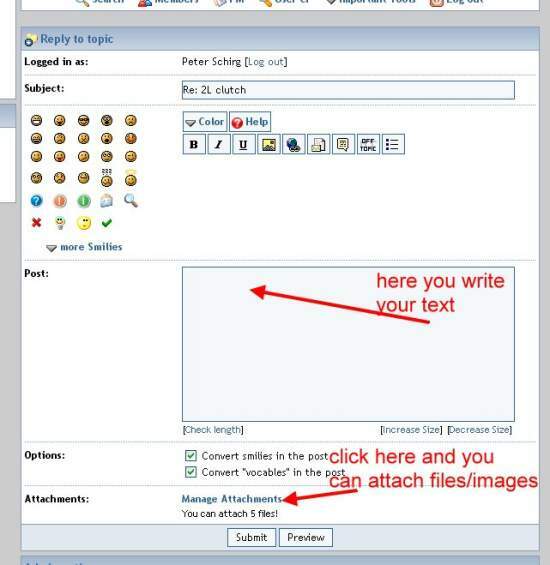 An overview how to use the BBcode feature in this forum is below. Written by anton at Nov 29, 2007 12:55 pm. Last change at Jun 12, 2012 12:00 pm.